The 3000 km long train trip from Delhi to Cochin on way to Lakshadweep, took me through through several states, probably seven. The second morning of my journey found me somewhere in Maharashtra. I bought a newspaper named 'The Hitavada' at a station named Balharshah located on the Maharashtra and AP border. This paper is being published from Nagpur and did not have the classy look of a leading daily. Yet it was written in bold as one of the largest circulating daily of Vidarbha. There were very little interesting news or gossip items to read. Then a photo caught my attention. It was a photo of a procession by a group of girls in Sivasagar, Assam. I was piquantly surprised. This happened to be an UNI photo. 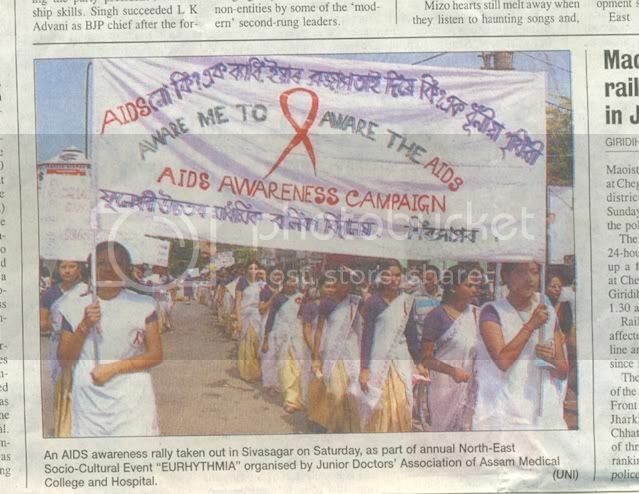 A group of girls from a college in Sivasagar taking out a procession for AIDS awareness. The main motive of publishing the photo is certainly to fill up vacant spaces, as the newspaper appeared to be short of ideas or news. Otherwise what importance a procession in a place called Sivasagar somewhere, which probably no one had heard in that area, hold in Vidharbha. But this reminds one of the advancement in media and communication has made. One visible form of this is that your photo clicked by the neighborhood journalist can get published in places you have unheard of. If you happen to know anyone of those appearing in the photo, please pass on this piece of information.